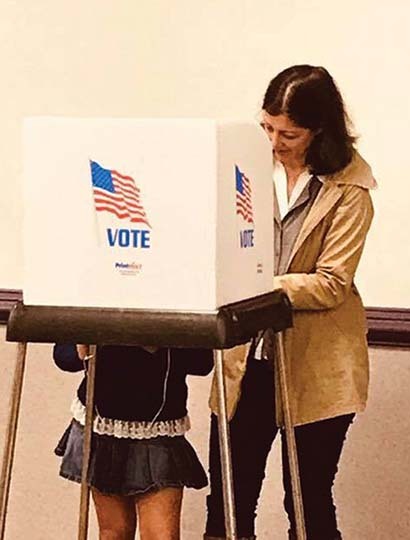 As many seats in the U.S. House of Representatives switched from Republican to Democrat, Elaine Luria was part of the trend in a narrow victory over incumbent Scott Taylor in Virginia’s second district. Luria, a native of Birmingham’s Jewish community who also has family in New Orleans, received 139,350 votes to Taylor’s 133,335 in the Nov. 6 election. The district was seen as a possible swing district, having voted for President Donald Trump by a 3 point margin, but in 2017 preferring Democrat Ralph Northam by 4 points in the gubernatorial election. In April 2017, Luria retired from the U.S. Navy after 20 years of service. The hard-fought race included allegations that the Taylor campaign was supporting a third-party candidate in an effort to split the opposition, including his campaign staffers allegedly forging signatures on petitions to get the third party candidate on the ballot. The Friday before the election, Norfolk resident Clair Berube reported that two hooded men knocked on her door and asked if she and her son were planning to vote in the election. When they replied that they were, one of them said not to vote for Luria, using an anti-Semitic slur. An Indian Springs alumna, Luria graduated from the Naval Academy in 1997 with a degree in physics and history. After being commissioned, she served aboard the USS O’Brien, based in Yokosuka, Japan. When she entered the academy, women were not allowed to serve on combat ships, but that ban was lifted in 1995, and she became one of the first women able to serve her entire career on a ship. When she retired, she was commander of Assault Craft Unit TWO. Under her command, the unit deployed to operations in Honduras, Panama and Norway, and humanitarian and disaster relief operations following Hurricanes Joaquin and Matthew. In 2013, she also became a small businesswoman, establishing the Mermaid Factory in Norfolk, and later a second location in Virginia Beach. The Mermaid Factory has blank mermaids and dolphins that visitors can paint and decorate.